One thing I am looking to do is grab some audio and video with allotment gardeners in the UK. I hear so much about allotments and the various reasons people garden there and I want to take some time to talk with them and get their thoughts and advice. I am scanning the maps and satellite pictures of the UK cities we are visiting and think I have found several allotments. Now I just need to take the time to go there and see what is happening. If you have any advice on places I might visit, please pass along a note in the comments. I am on a kick to green up the garden this season, even if we are entering the hot part of the year. 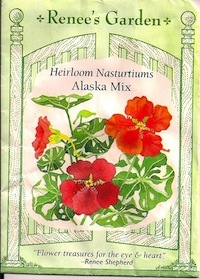 To that end, I have recently upgraded some irrigation using soaker hoses and today, on a whim, I planted some nasturtiums (seed packet in picture) in the patio bed outside the back door. It is probably not the best time of the year, but I am running forward full speed ahead. My watering costs are usually not the largest part of my utility bill, so I am ok with a bit more watering this summer as I try to make some changes. That said, I don’t mainly use sprinklers. Every thing is on soaker hoses at the moment, so that helps make the watering as effective as possible. So, I took a few minutes this evening to carefully plant the seeds. Unlike my typical, sloppy planting methods, I took note of depth and spacing and really tried to make sure I gave them the best chance possible. 9-12 days should show if that was truly the case. Images from a short walk in Millard Canyon, Angeles National Forest, just north of Los Angeles. 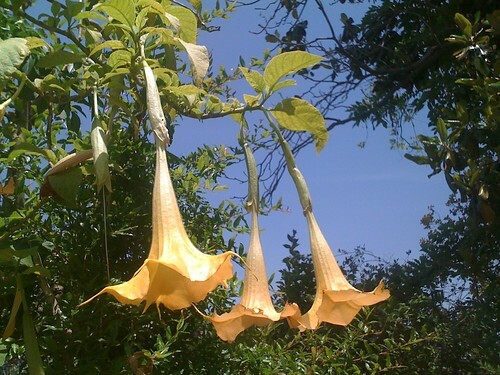 While these shots are out in the “wild” mountains north of Los Angeles, there is a gardening link. If and when you design a water feature in your garden, it pays to go out and take a look at the way nature does it. In this video, I especially noted how twigs and limbs that have fallen from the surrounding trees have created dams which collect smaller stones and directly effect how the water flows down the creek. It also is very important to the sound of your water features. You will most likely have to change the position of the elements in your water feature until it sounds like you want. Sound is also very important for attracting wildlife, if you wish. Birds and other animals are quickly attracted to the sound of running water, especially if other sources are limited. This is one reason I am working hard to get a water feature installed in my garden. I love having the birds here, so anything that helps attract them would be great. Jacaranda mimosafolia on my walk, originally uploaded by dewelch. 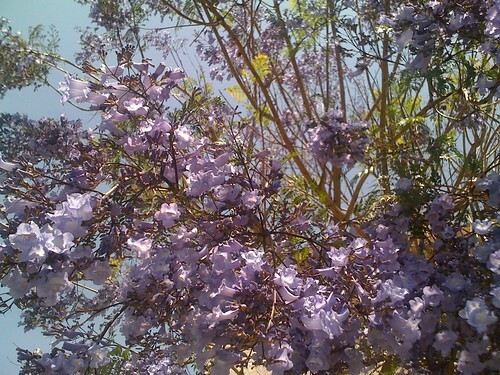 The jacarandas are in bloom here in LA. A great bright purple show that takes place every year. Brugmansia seen on my walk, originally uploaded by dewelch. Came across this lovely Brugsmansia on my walk today. Still, I can live vicariously through this Flickr slide show from those that DID make it. There is also a lot of video on YouTube. The previous owners planted a large series of geometric beds with azalea and juniper in the front garden long before we owned the property. Over the course of a year, these plantings can get quite shaggy. Typically I use the hedge trimmers on them, due to their geometric shapes and size. It isn’t the preferred method of pruning azaleas, but more of a “make do” arrangement. The azaleas need to be trimmed after they bloom, but before they set new growth and buds for the next flowering season. Several times in the past, including last year, I have missed this window and been forced to wait another year before pruning. This makes the job more difficult, but it still has to be done. We are slowly reworking all of these beds to change the character of the front yard The junipers inter-planted with the azaleas are all dying. 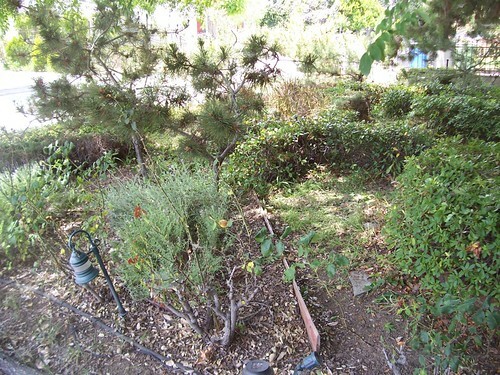 As we remove them, I am either clearing the entire bed, as we did with the lavender bed in the foreground of the photos or “naturalizing” the beds by removing any juniper and a few of the azaleas and then letting the remaining azaleas grow into a more naturals shape and size. I took advantage of a beautiful, cool day yesterday to work through these beds. It is hard to tell in the photo, since all the green blends together, but all the geometric beds are now neatly trimmed, except for a few stragglers along the bottom. These I will have to clean up by hand, one at a time. I was lucky to get some time yesterday, as this project really needed to be done before we leave on a trip to the UK in mid-June. I probably would have still been within my window of time, but the temperatures here were sure to be a lot hotter and make the job a lot more uncomfortable. Finally, there are a series of large azaleas which grow against the front of the house. These have been spared the hedge trimmer and, to my eye, look much more appealing and natural in their habits. 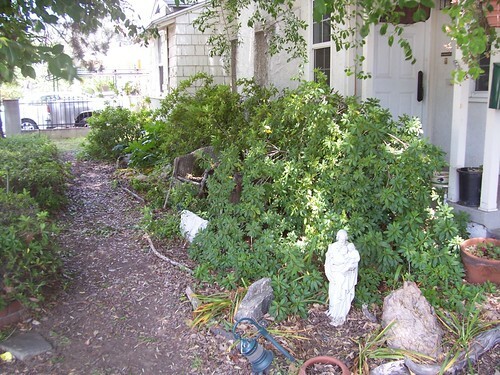 Still, they need to be pruned every so often, lest they consume the front of the house. I hand prune each of these plants, working to maintain a low, somewhat weeping habit. They seem to like this treatment as they never fail to bloom amazingly each year. That job will have to wait until we return from our trip, unfortunately. 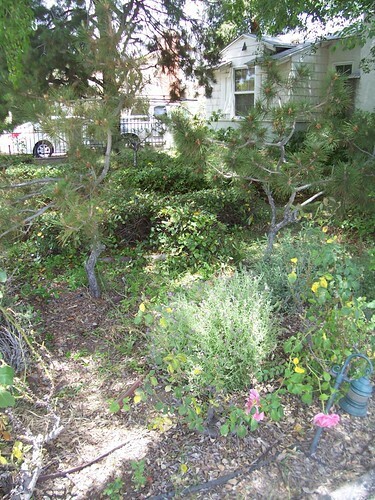 Along with that job, I also hand prune the small (although growing larger) pines in the front garden. I describe it as “bonsai in place”. My goal is to keep them small and then prune them in a way that encourages a twisted/gnarled arrangement to the limbs. It seems to be working, so far, although right now they appear more like fuzzy pom-poms instead of the bonsai I prefer. This requires quit a bit of time, although I describe the process as particularly zen-like. I look, I think, I prune, look, think, prune and then repeat again and again until I have what I am looking for. I think this feeds my artistic sensibilities much as painting would. Stay tuned here for more projects to come this summer! 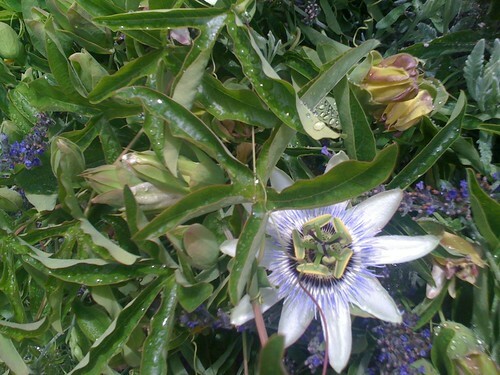 Passiflora – Passion Flower – 4, originally uploaded by dewelch. A neighbor has this extremely healthy set of Passiflora vines growing on a wall along the sidewalk. It never fails to put on a great show every year.